Gold lost half a per cent on Monday, on course for its sharpest one-day loss in three weeks as a surprisingly upbeat US job market report dented the precious metal's appeal as a hedge against inflation. The US unemployment rate unexpectedly dropped to a near four-year low of 7.8 per cent in September, raising some doubts on whether the stimulus measures put in place by the Federal Reserve to boost the labour market would last as long as initially thought. Rampant cash printing as a result of easy monetary policy drives investors to bullion to hedge risks arising from an increased inflation outlook. Gold jumped nearly 5 per cent last month, during which the Fed and European Central Bank each announced aggressive easing measures. "The good non-farm payrolls number raises doubts on whether QE3 will sustain and puts pressure on gold in the short term," said Li Ning, an analyst at Shanghai Cifco Futures, referring to the latest round of quantitative easing by the Fed. Spot gold dropped 0.5 per cent to $1,771.50 an ounce by 0319 GMT, headed for its biggest daily loss in three weeks and taking it further away from the key $1,800 level that was last broken above in November last year. 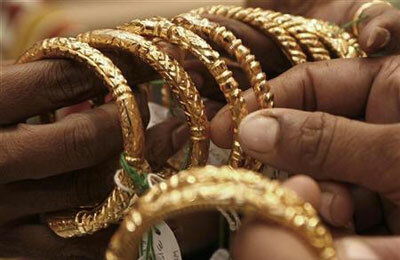 US gold fell 0.4 per cent to $1,773.60. Technical indicators suggest spot gold could drop to $1,757 per ounce during the day, Reuters market analyst Wang Tao said. But worries about global economic growth and geopolitical tensions in the Middle East continued to whet investors' appetite for the safety of bullion. Holdings of gold-backed exchange-traded funds stood unchanged at a historical high of 74.696 million ounces by Friday. Speculators raised their net length in US gold futures and options to 195,647 contracts in the week ended October 2, it highest in more than seven months. "Though gold may face pressure and could retrace a bit in the short term, the medium to long-term outlook is still bullish," said Li of Shanghai Cifco. "The continuous safe-haven demand, as well as lack of confidence in paper currency, will probably push gold to a new high later this quarter or in the first quarter next year." Cash gold hit a record high of $1,920.30 last September. Investors have shifted focus to the euro zone debt crisis yet again, as the debt laden members continued to struggle. German Chancellor Angela Merkel will visit Greece this week as Athens said it would run out of money at the end of November without fresh international aid. The World Bank cut its economic growth forecasts for the East Asia and Pacific region, and said there was a risk the slowdown in China could get worse and last longer than expected. Among other precious metals, spot platinum lost 0.9 per cent to $1,688.49, headed for its biggest daily fall in two weeks. Spot palladium fell 0.8 per cent to $651, on course for a second day of loss.